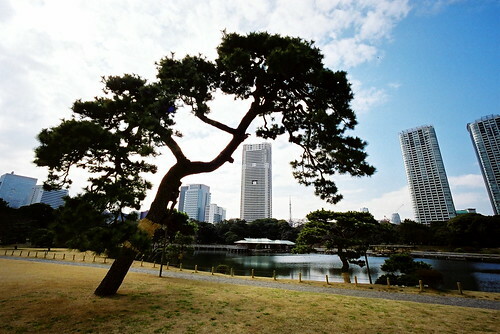 The Hamarikyu Detached Palace Garden is one of the disembarkation points of the Sumidagawa river cruise. It’s pure sculpture, almost as if you’re walking through someone else’s dream of the structures of plantlife. I get a similar feeling to this sometimes when I visit Joshua Tree in California — it’s as if the shapes of the trees are somehow beckoning meaning in a strange and unremembered language. It’s experiences like this that make me want to undo the standard categories of empirical sensation — I mean, why isn’t the aesthetic sensation of strange language that some physical objects produce actually a valid type of sensation? It’s certainly not a cognition, or an act of symbolic decoding that’s at work here. It’s a physical conversation between physical things. In any case, the ‘physical thing’ that this garden once was was one of the Shogun’s palaces — I believe this one was a summer palace, but I can’t be sure. 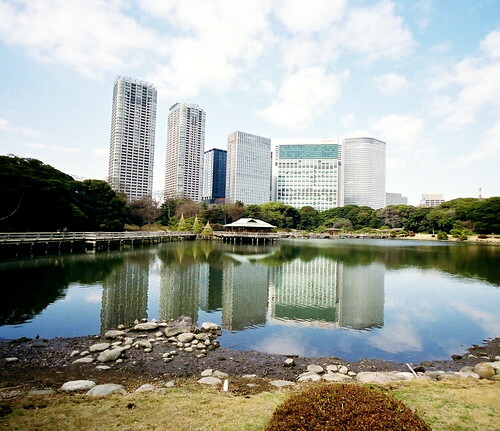 Hamarikyu is a classic stroll garden and as you move through space various vistas of enjoyment and contemplation open themselves up to the viewer, with the island teahouse in the reflected lake at the center. While it’s essential to take tea at the teahouse, I think my favorite experience at Hamarikyu was meeting the 300 year-old tree at the edge of the grounds — an amazing creature of a tree with its several limbs tracing bent and gnarled patterns, propped up on stilts like an arthritic old man with bright green shoots of pine bursting out at all the joints of his body. Although the pine tree above isn’t 300 years old, I still like this shot for what I think are pretty obvious reasons. What’s interesting about Hamarikyu Onshi Teien is the way that the skyscrapers have been built up around it to become a kind of ‘borrowed scenery.’ It’s quite standard for Japanese gardens to incorporate distant views as part of the experience of the garden itself — a famous example is Korakuen’s incorporation of the view of Okayama Castle into the garden’s formal aesthetic — but here a kind of reverse incorporation happens that still manages to produce dramatic effects. I think it’s a mistake to try to cut these skyscrapers out of the scene. 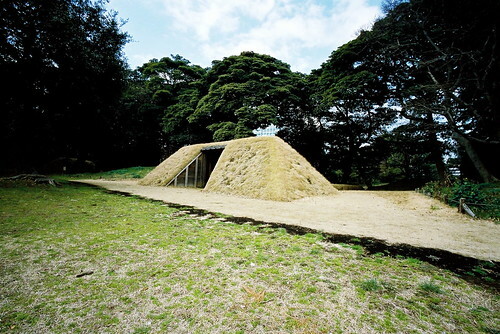 This strange mound of grass and earth apparently had something to do with duck hunting. Was it a duck blind? Not sure. I like its shape as the model for some kind of abstract idea of a tundra house. 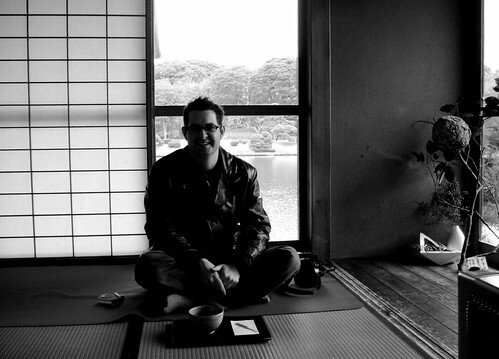 Here I am taking tea in the teahouse at the Hamarikyu Detatched Palace Garden. The important thing to note in this photo is the round, marbled paper wasp nest that forms the centerpiece for the ikebana in the corner of the room. According to the woman working at the teahouse, this nest was found in the garden several years ago. I’ve never seen a wasp’s nest so perfectly round, with an absolutely stunning pattern of swirls that alternate in dark and light waves like moiré chocolate sauce in melted ice cream.